The new Miss America will be crowned in front of a national audience on Sunday night. And it’s been a long road for the future title holder, including this past week of preliminaries, parties, meet-and-greets and endless preparation for what each of these 53 women hope will be their crowning moment. Mac Duggal has played a prominent role in the Road to the Crown, as the choice of several of these talented women for what to wear to represent themselves and their state in this 92-year-old tradition of pageantry, scholarship, and female empowerment all rolled into one. Brittany looked sleek in ivory during the Evening Gown preliminary in style 70002R from the Black White Red Collection, with gorgeous angled accents, a gold belt and structured peplum. Making national news, Nicole is the first Miss America contestant born missing part of a limb. Nicole’s platform is to aid and support children with disabilities, and we’re proud she chose as her Evening Gown choice, style 61359P from Mac Duggal Pageant. Theresa made waves during the preliminaries as well, as this National Guard Sergeant and expert marksman took to the stage in the swimsuit competition showing off her two tattoos. Theresa picked Mac Duggal Couture for her Evening Gown choice, style 61566D. 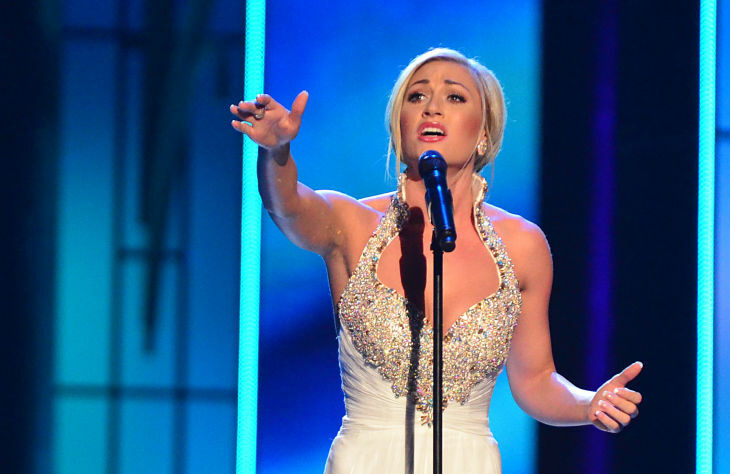 Rebecca double-dipped in Mac Duggal at preliminaries, and we couldn’t be happier. The violinist chose a red peplum creation from the Spring 2014 Mac Duggal Black White Red Collection, style 61726R, to wear during her Talent preliminary, which she won! Rebecca also looks picture perfect in purple in her Evening Gown choice, style 43003P from Mac Duggal Pageant. 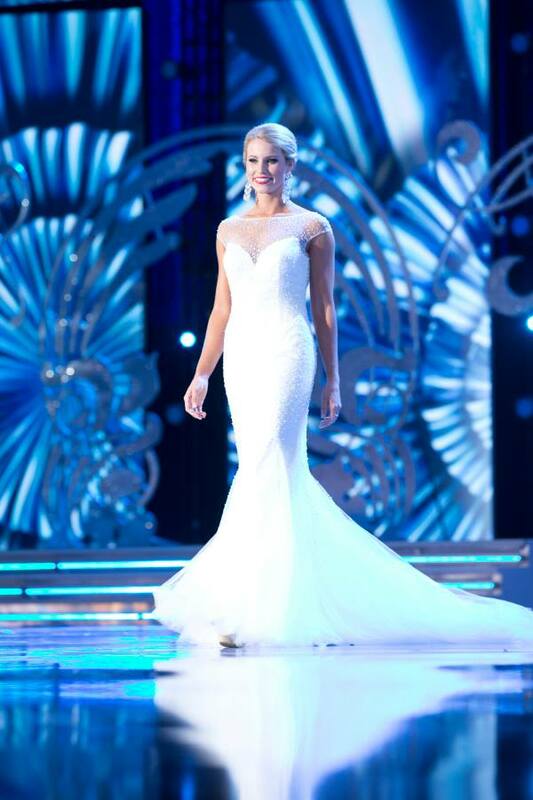 Brooke was a vision in white in Mac Duggal Pageant! 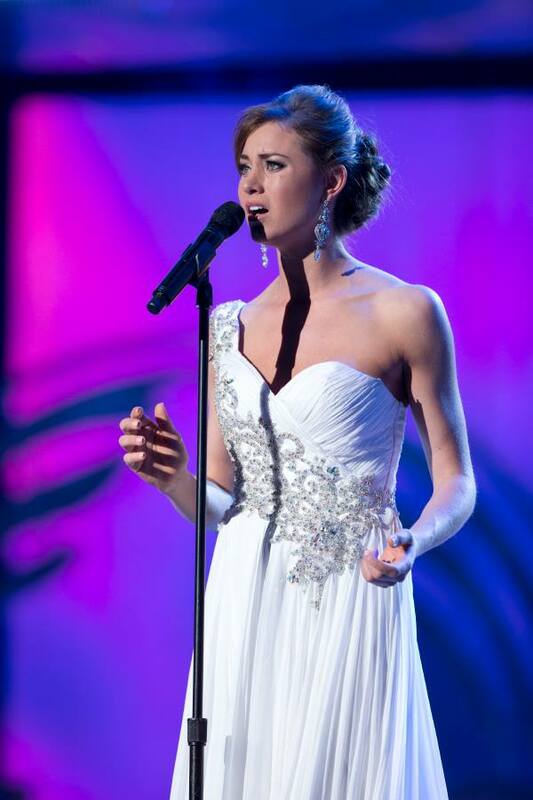 She chose this gorgeous chiffon gown with cascading crystals for her performance during the Talent preliminary. Laura looked like the picture of style and grace when she took to the stage to sing during the Talent preliminary, dressed in the fabulous taffeta and lace creation from the Black White Red Collection, style 61393R. With sizzle and style, Jessica took to the stage during the Talent preliminary in a fringe and lace Mac Duggal custom creation. Jessica took to the stage in the Evening Gown preliminary in a Mac as well, picking this fabulous vintage-inspired mermaid gown from the Black White Red Collection. The taffeta gown with lace and illusion top is Mac Duggal style 61391R. One of our most exquisite gowns, Christina was truly stunning as she walked the stage in the Evening Gown preliminary in style 1195D from Mac Duggal Couture. With style and sparkle, Shenti grabbed attention in a sparkling Mac Duggal Pageant gown that glittered with golden embellishments, style 50080P. Between her gown and smile, Shenti was all shine during the Evening Gown preliminary. With floating layers of chiffon and a gorgeous beaded halter neckline, Ciera looked stunning in an aqua gown from Mac Duggal Pageant during the Evening Gown preliminary , style 43017P. Ciera also chose Mac Duggal for her Talent gown as well, stepping on to the stage to perform in a Mac Duggal Pageant Collection gown, style 43006P. Miranda was the Lady in Red as she stepped out on stage in a Mac Duggal Pageant Collection gown for the Talent preliminary. The blonde stunner looked wonderful in the crystal bedecked style 81619P. Haley was red-hot in the Evening Gown preliminary in Mac Duggal Pageant, style 43005P, with dazzling beading on the bodice and an exquisite flowing red skirt. Paula was looked regal in this fabulous deep purple gown from Mac Duggal Couture. The gorgeous strapless mermaid gown is style 81954D, and Paula nailed it for the Evening Gown preliminary. Crystal took to the stage of the Evening Gown preliminary looking graceful in red in this wonderful Mac Duggal Custom gown. Amanda struck gold in a shimmering body hugging halter top gown during the Evening Gown prelim, a custom creation by Mac Duggal! Ivana was stunning as she graced across the stage in this fabulous white chiffon beaded gown from Mac Duggal Pageant during the Evening Gown preliminary. With so much talent, confidence and poise on stage, there’s no telling who will take home the crown this year! 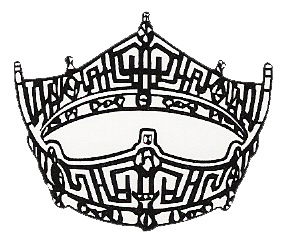 Miss America 2014 will be crowned at the conclusion of the live Miss America Finals, Sunday, Sept. 15, at 9 p.m. Eastern on ABC.